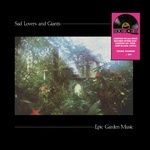 "Sad Lovers And Giants' first full album, a brilliant atmospheric post punk album, elements of Joy Division and The Chameleons and more tellingly of bands that followed. Recorded in 1983, Feeding The Flame showcases the original line up at their very best. Featuring the bonus track 'Close To The Sea.' Innersleeve with lyrics."